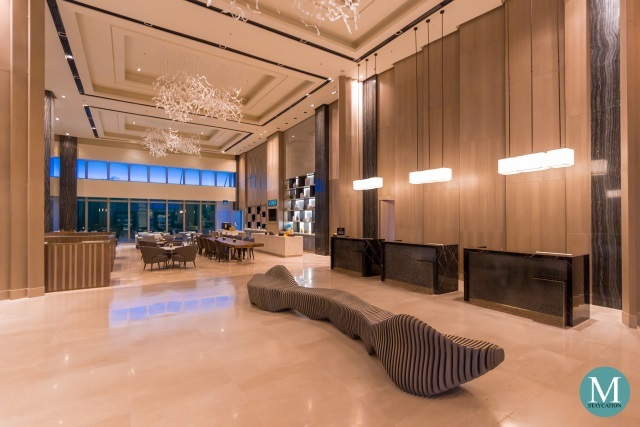 Escala Tagaytay is one of the newest and most stylish hotels in Tagaytay City. 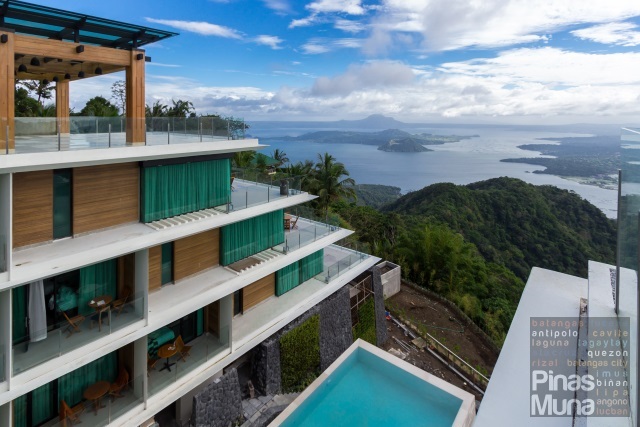 The property opened last November 2016 and has quickly gained popularity primarily because of its ultra modern design, central location, and spectacular view of Taal Lake. Escala Tagaytay is located along Tagaytay-Nasugbu Road, right next to Sky Ranch and very near Summit Ridge Promenade. 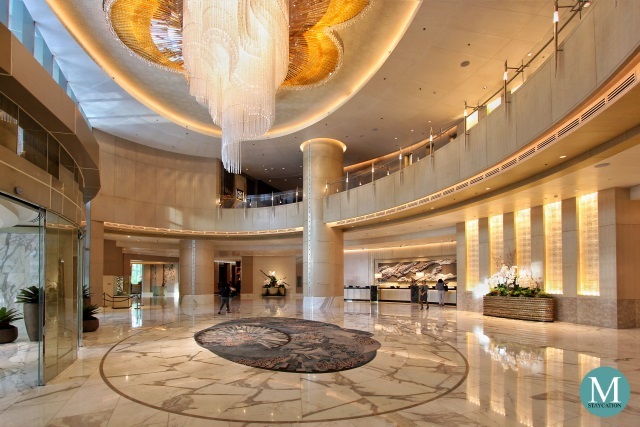 Entering the hotel's massive wooden door will lead you to the lobby furnished with modish sofas and couches. The glass windows bathe the space with plenty of natural light while the refreshing cool breeze coming from the veranda will welcome the guests to their relaxing weekend escape from the city. 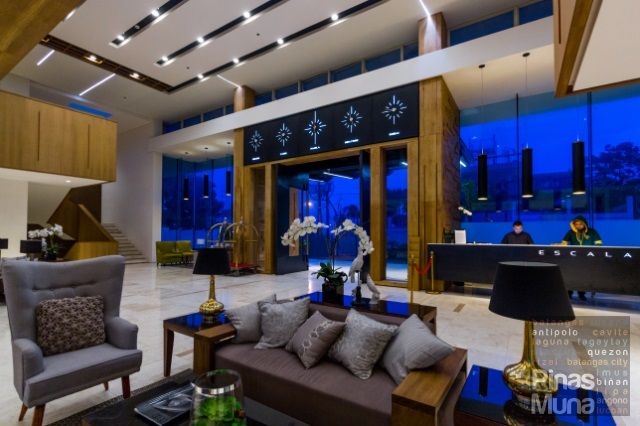 Escala Tagaytay rates among the best Tagaytay hotels, and this is easy to understand because of their well-appointed rooms coupled with modern amenities and conveniences. 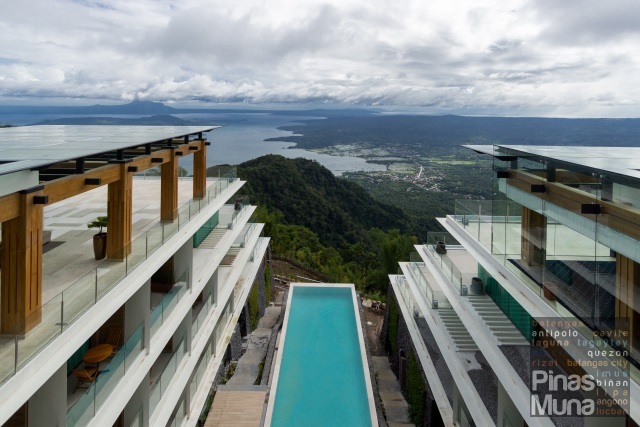 Guests staying at Escala Tagaytay enjoy spectacular views of Taal Lake and of the hotel's stylish infinity pool. 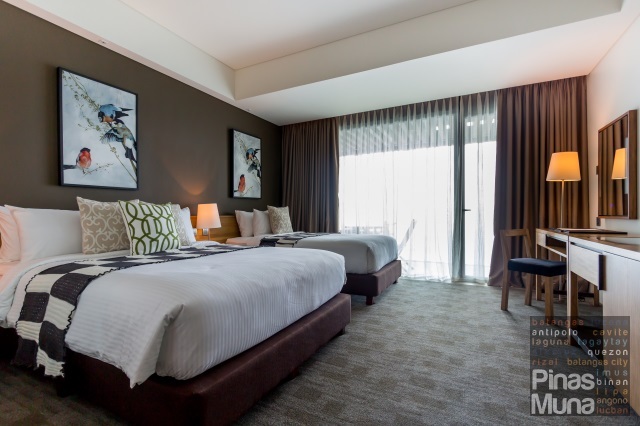 We stayed in a Premier Room during our weekend visit to Escala Tagaytay. 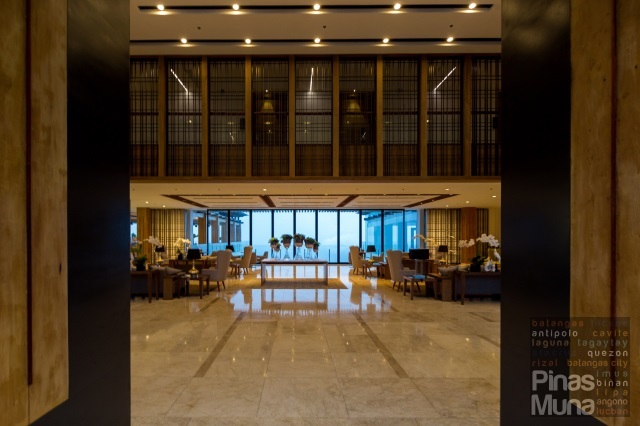 Premier Rooms are located on the topmost floor of the hotel with each room having its own private veranda overlooking the infinity pool and Taal Lake. The room measures 39 square meters and is furnished with a queen bed and a solo bed. There's a writing desk, a minibar, and coffee and tea making facility. 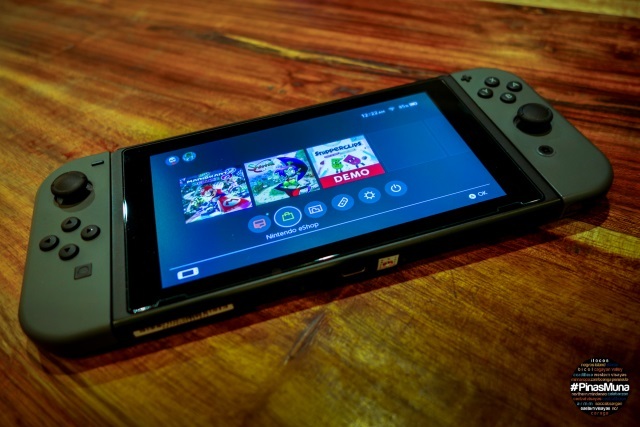 The room is equipped with an individually controlled airconditioning unit and a flatscreen television with local and international satellite channels. The private bathrooms is also spacious. 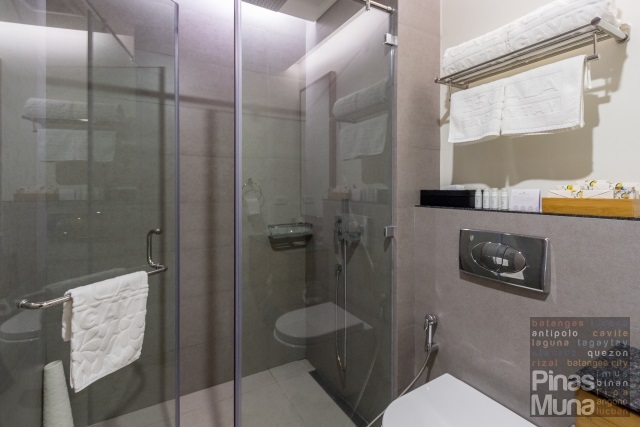 The walk-in shower is fitted with a rainfall showerhead wile the toilet is equipped with a bidet. High quality towels and complimentary toiletries are also provided. Water pressure was consistently strong during our stay. Here's the view of the hotel from our room at night. 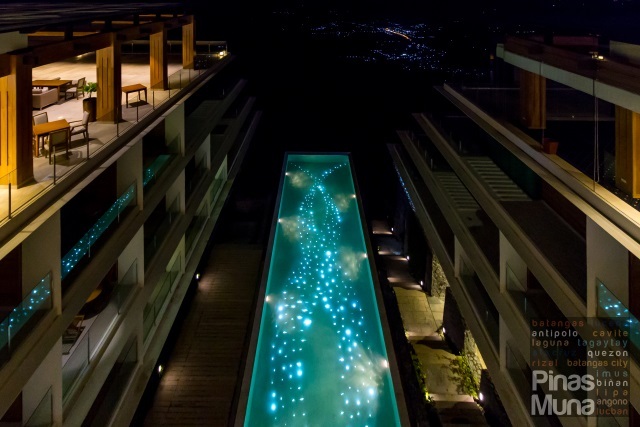 I particularly loved the underwater lighting of the infinity pool which seemed to extend to the city lights near Taal Lake. Our private veranda was also a great venue for some evening drinks and snacks. During our stay, we enjoyed sipping on hot chocolate we bought from the nearby Starbucks while munching on apple tarts we bought from Rowena's. 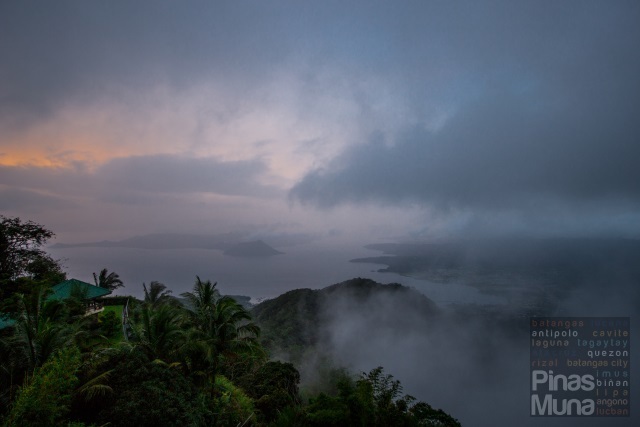 When staying at Escala Tagaytay, make sure that you wake up to catch the sunrise. Guests staying in Family, Executive and Prestige rooms will enjoy the view from their private verandas while other guests can head to the veranda of the hotel's restaurant. 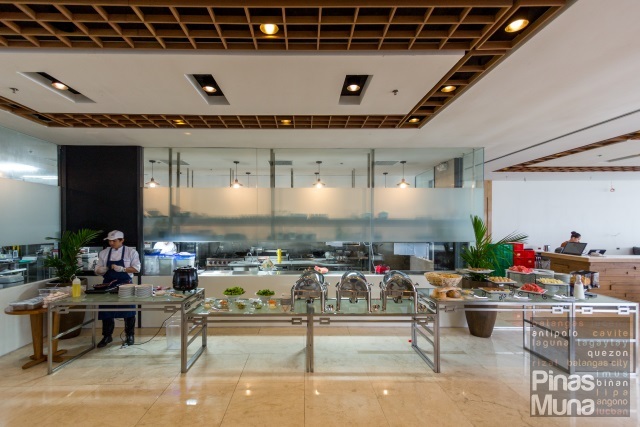 One of the highlights of our stay at Escala Tagaytay was the breakfast buffet. Most items were Filipino food. There's also a fruits section and an egg station where you can have scrambled, sunny-side, hard-boiled or omelet made a la minute. There's plenty of seating available. I personally prefer the tables near the veranda. 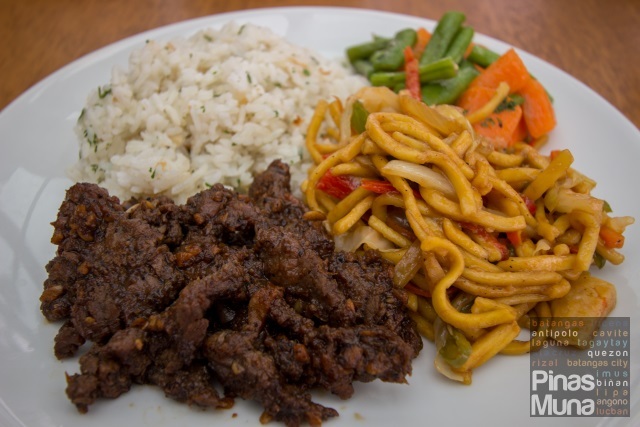 My favorite was the beef tapa which has a salty-sweet taste which makes it perfect with vinegar and garlic. They also make very good pancit canton. 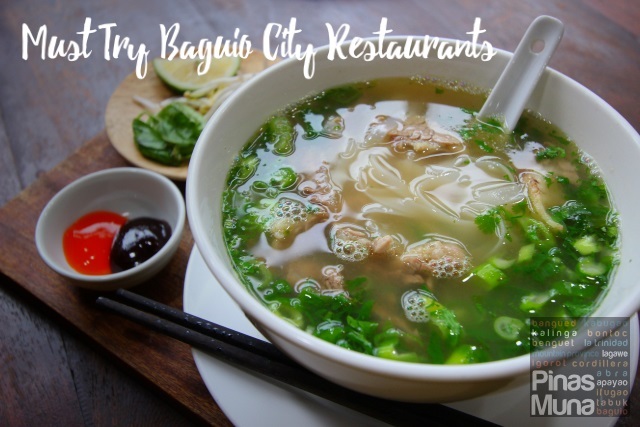 What I also love about Tagaytay is the freshness of their vegetables and fruits. Escala Tagaytay also serves free-flowing Tagaytay coffee which perfect during the cold mornings. Despite Tagaytay's high elevation, it can still get very warm. The rest of the morning is best spent at the infinity pool. It is one of the swimming pools with the best view in Tagaytay so don't miss the chance to try it. 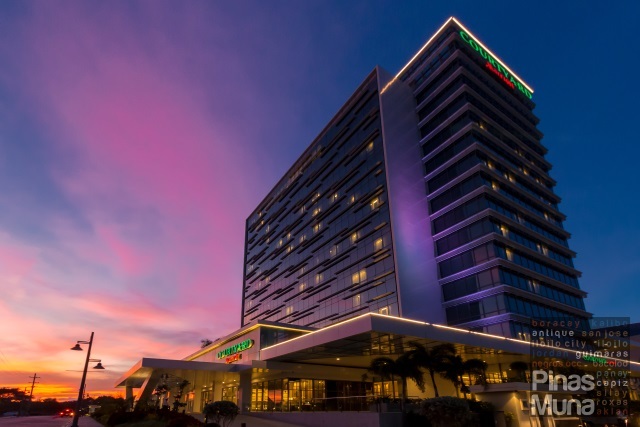 Escala Tagaytay also has a fitness center equipped with modern work-out machines and free-weights. Alternatively, you can also book an in-room massage. 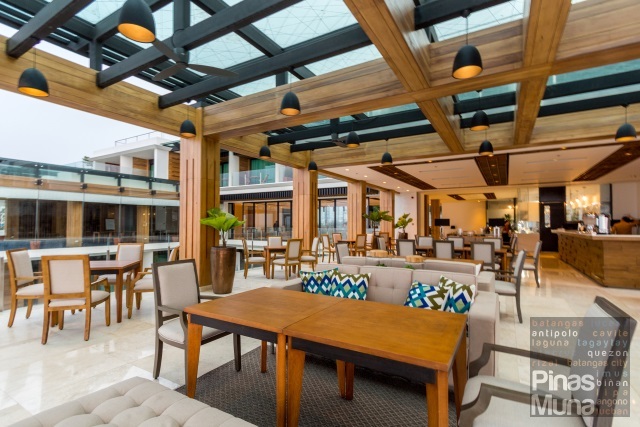 Escala Tagaytay is indeed a great addition to the ever growing accommodation options in Tagaytay. 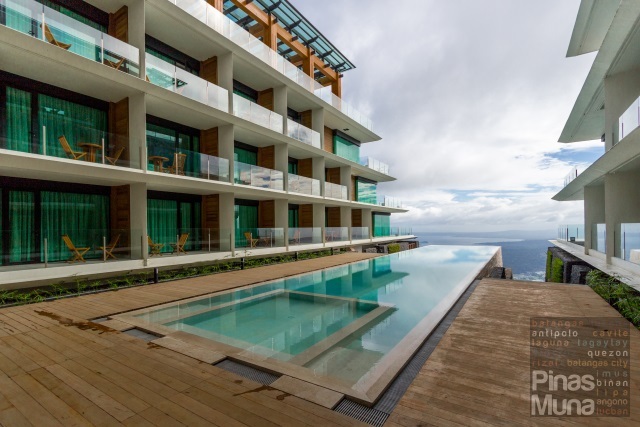 But what set Escala Tagaytay apart from other properties are its cutting-edge design, modern and stylish interior, world-class room amenities and spectacular frontrow views of Taal Lake. 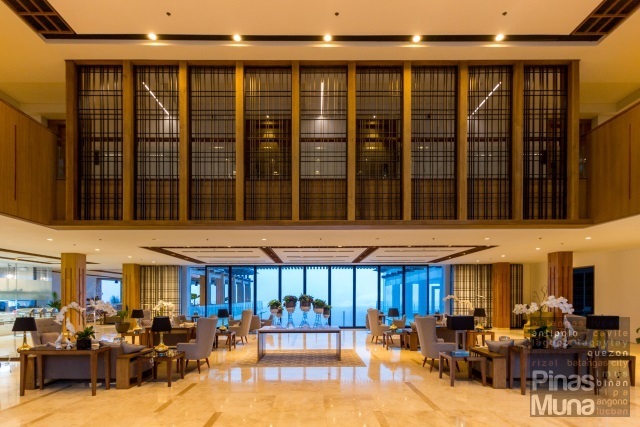 Escala Tagaytay is totally worth your roadtrip. If you are driving to Tagaytay via Sta. Rosa or Aguinaldo Highway, just search for Escala Tagaytay on Waze or Google Maps mobile applications. Along Tagaytay-Nasugbu Road, make sure that you turn left at the Petron Gas Station. Entrance to Escala Tagaytay is right after Meralco to your left side, and right before you reach Sky Ranch. You can take the Tagaytay-bound bus from the South West Integrated Provincial Transport (SWIPT) Terminal at Hong Kong Sun Plaza along Macapagal Boulevard. Tell the conductor to drop you off at Petron Gas Station. At the gas station, transfer to the other side and take a jeepney along Tagaytay-Nasugbu Road. Tell the driver to drop you off at Sky Ranch. Cross the road and walk toward your left. Look for the sign leading to Escala Tagaytay.